Welcome to WoW Circle - the game server. 12 realms with the rates: Classic 1.12.1 x3, Wotlk 3.3.5a x1, x5, x10, x100, Fun, Cataclysm 4.3.4 x25, x100, Fun, MoP 5.4.8 x100, Fun, Legion 7.1.5 x4. Maximum working PvP and PvE content. The updates for the realms are made twice a month and more, that’s why all the bugs get fixed rather quickly. Hardware for logon/mop located in central Europe, for logon3 in Eastern Europe, it's providing an excellent ping from anywhere in the world. О персонале и его работе. 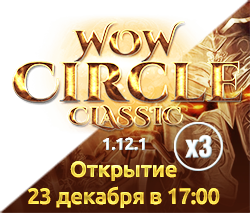 Продолжение статьи об управлении проектом WoW Circle, теперь более подробно о персонале.